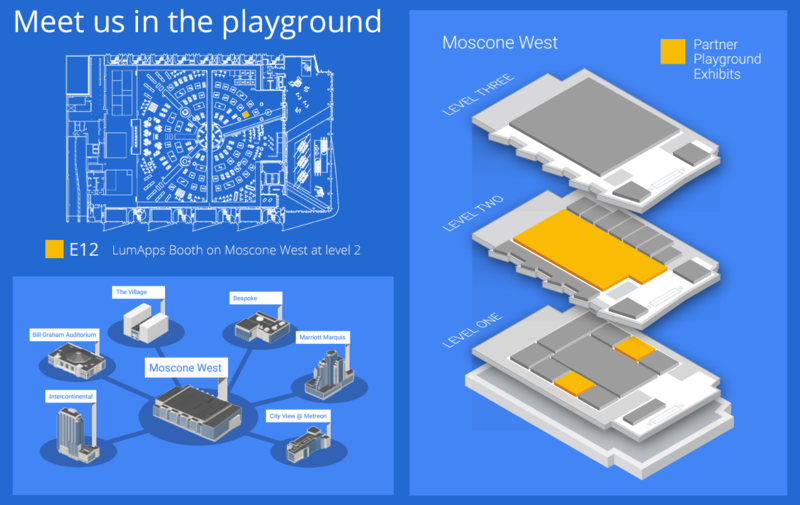 LumApps is gearing up to attend Google Next from March 8-10 in San Francisco, and we hope to see you there. It’s going to be a fantastic gathering of the global Google Cloud community – the perfect forum to learn about LumApps cloud business communications solution. Visit us at booth E12 on the playground for a hands-on demo or to chat with LumApps staff about your company’s specific needs and initiatives. During the all-day event, our LumApps team will be wearing yellow shirts and will be easy to recognize. Feel free to speak to us! If you want to schedule a meeting with a member of our team, please send us an email with the name of the person you would like to meet and the reason. 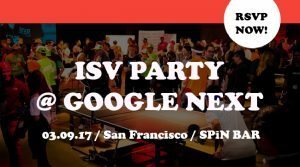 With 3 others Google Recommended ISVs, we’re hosting an exclusive VIP party at Spin Bar on Thursday, March 9 at 7:00 p.m. – a five-minute walk from the Moscone Center. The Ping Pong tournament with food, drink and dancing will be a great escape from the show and a nice chance to connect. Make a reservation for the Recommended ISV Party. Thorsten Luedke, from the Recommended for G Suite Program that endorses 15 third-party app partners (including LumApps), organizes a session to present how you can spend less time managing your software and more time growing your business with business apps integrated with G Suite. During this session, on Friday, March 10 at 2:40pm on CP222, Moscone Center West / Room 2016, Lucy Luo, Project Manager at Veolia, will be providing insight on the business objectives he has achieved with help from LumApps. Reserve your seat for this conference. In this developers session, on Thursday, March 9 at 11:20am on TBD / Marriott Marquis, Salon 10, you’ll learn what you can do with Google Drive API. Elie Mélois, our CTO, will show you the integration of Google Team Drive in LumApps with some use cases based on our customers feedback. Wednesday, March 8 at 2:30 p.m.
Wednesday, March 8 at 5:00 p.m.
Thursday, March 9 at 10:45 a.m.
Thursday, March 9 at 5:00 p.m.
Friday, March 10 at 10:45 a.m.
And don’t worry, if you are not the lucky one announced at these times, you will be able to get some other awesome prizes and giveaways at our booth. Looking forward to meeting you and your colleagues at NEXT’17.